What are the types of solids? Explain Crystalline and amorphous solids. As we know that the matter is a substance that has inertia and occupies physical space and in the view of modern physics matter consists of various types of particles, each with mass and size. The matters can exist in several states like solid, liquid and gas. Less familiar states of matter include plasma, foam and Bose-Einstein condensate. These states occur under special conditions. All matter such as solids, liquids, and gases, is composed of atoms. Therefore, the atom is considered to be the basic building block of matter. Atoms are very small and typical sizes are around ~100 pm. A combination of atoms forms a molecule. Atoms and/or molecules can join together to form a compound. Now we discuss about Crystalline solids and Amorphous solids. have two characteristic properties. When cleaved or broken, they produce fragments with irregular, often curved surfaces; and they have poorly defined patterns when exposed to x-rays because their components are not arranged in a regular array. Almost any substance can solidify in amorphous form if the liquid phase is cooled rapidly enough. 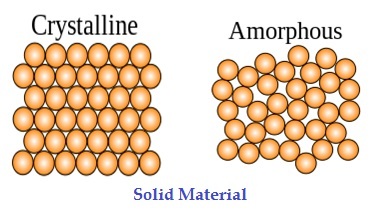 Some solids, however, are intrinsically amorphous, because either their components cannot fit together well enough to form a stable crystalline lattice or they contain impurities that disrupt the lattice; they reflect the irregular arrangement of the component atoms, molecules, or ions in space. So that the key difference between the crystalline and amorphous structure is the ordering of the structure. Crystalline structure can be thought of as the highest level of order that can exist in a material, while an amorphous structure is irregular and lacks the repeating pattern of a crystal lattice. Crystals have highly ordered (regular periodic arrangements in all direction) three-dimensional arrangements of particles. Crystalline solids have characteristic geometrical shape. Planes of a crystal intersect at particular angles. Crystals have sharp melting and boiling points. Solids that don’t have a definite geometrical shape are known as Amorphous Solids. Amorphous solids don’t have sharp melting points. Amorphous solids melt over a wide range of temperature. In these solids particles are randomly arranged (irregular periodic arrangements) in three dimensions. Amorphous solids are formed due to sudden cooling of liquid. The branch of physics that deals with solids is called solid-state physics. According to the band gap concept the solid material specified in three categories such as Conductor, Insulator, and Semiconductor. As we know that Conductors have very low resistivity, usually in the µΩ- metre. This low value allows them to easily pass an electrical current due to there being plenty of free electrons floating about within their basic atomic structure. Similarly the band gaps of conductors are also very low. An insulator is also known as non metal and which is exact opposite to conductors with high resistivity. The band gap of Insulating material is very high. The Insulator are made of materials that have very few or no “free electrons” floating about within their basic atom structure because the electrons in the outer valence shell are strongly attracted by the positively charged inner nucleus. So if a potential voltage is applied to the material no current will flow as there are no electrons to move and which gives these materials their insulating properties. Examples of good insulators are Plastic, rubber, p.v.c. etc. Semiconducting materials such as silicon, germanium have electrical properties somewhere in the middle, between those of a conductor and an insulator. They are not good conductors nor good insulators. Semiconductors have very few free electrons because their atoms are closely grouped together in a crystalline pattern called a “crystal lattice”. These types of semiconductor are also known as pure or intrinsic semiconductor. The band gap of Si and Ge semiconductors is 0.7ev and 1.11ev respectively. However, their ability to conduct electricity can be greatly improved by replacing or adding certain donor or acceptor atoms to this crystalline structure thereby, producing more free electrons than holes or vice versa. That is by adding a small percentage of another element to the base material, either silicon or germanium; and also called extrinsic (doped) semiconductors.